We had intended to go to Sissinghurst, but as we drove from Surrey into Kent the rain got steadily worse. After a wonderful but very dry summer, the English gardeners amongst us were in many ways delighted, but the New Zealanders were a little disappointed as it became apparent that a garden visit would be a very soggy experience indeed. We decided to opt instead for a visit to Churchill’s family home (with garden), Chartwell. Chartwell was purchased by Churchill in 1922 and was used as his family’s country home for over 40 years. However, from 1946 it was owned, not by the family, but by the National Trust: when it became apparent that financial constraints meant Churchill was considering selling the house, Lord Camrose and a group of Churchill’s friends raised the funds for it to be acquired by the National Trust, on the condition that the Churchills retain a life tenancy. Clementine relinquished the tenancy after her husband’s death in 1965 and the house was opened to the public in 1966. The first impression of the house does not bowl one over. It is a brick-built house that had been much re-arranged over the centuries and was almost completely rebuilt by the Churchills between 1922 and 1924. What is impressive is the view from the front of the house over the Weald of Kent. It was this apparently which appealed to Churchill and was a determining factor in his decision to purchase. He subsequently arranged for the society architect, Philip Tilden, to make extensive changes and additions, including an extension overlooking the garden and the views, which included a rather splendid dining area on the lower level, the drawing room above and Lady Churchill’s bedroom on the top floor. For those visiting the house and gardens, however, it is not the architectural merits of the house which are the draw, but the attempt to gain an understanding, however slight, of the great man himself and of his life, as well perhaps of his relationships with his wife, Clementine, and his children. One is left with a resounding impression of a dynamic and energetic man who needed to be constantly ‘doing’ and whose multifarious ‘doings’ were far more productive than most people’s. One leaves feeling very much smaller and with a nagging feeling that one has not put enough time and effort into life. 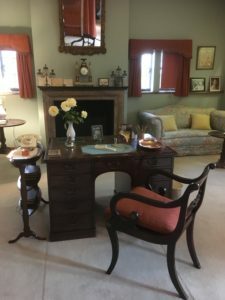 The way the National Trust has organised the house to receive visitors brings one in to visit first Lady Churchill’s sitting room, which is quite intimate and cosy with a portrait of a middle-aged Churchill over the fireplace. One then goes on to visit the library (oh, how I have always wanted to have my own library!) and the drawing room decorated as it was in the late 1920s and 30s. This is an attractive and appealing room containing a striking portrait of Clementine Churchill. Upstairs one gets the chance to admire some of Churchill’s own paintings hung in the corridor (including one of two entered into the Royal Academy summer exhibition under the pseudonym ‘David Winter) and then to visit Clementine’s bedroom and Winston’s study, ‘the heart of Chartwell’, where he worked late into the night after family and guests had gone to bed. 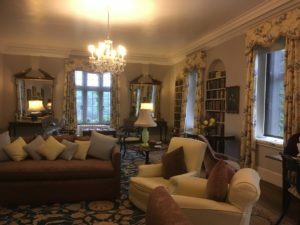 Several of the guest bedrooms have been amalgamated into a museum area, with artefacts, photos, medals and Churchill’s many awards. Whilst writing had always provided an income to help pay the bills, Churchill’s art on the other hand was not produced with the same aim in mind (even though some paintings were sold). Painting was his relaxation. Although this was a hobby which he started later in life (at 40), he was not entirely self-taught, as is commonly believed. He had the benefit of a number of professional artists (including Sir John Lavery and William Sickhert) who passed on their knowledge and experience. However, the person who taught him most about painting was, by his own admission, William Nicholson (1872-1949). 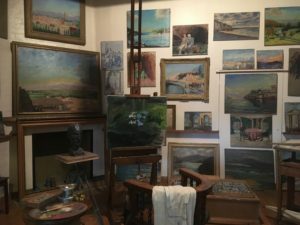 Having visited the house itself (which also includes a visit to the very old-fashioned kitchen in use when the Churchills arrived and an exhibition about Clementine Churchill’s life), it is time to go out to Churchill’s studio, where there are a good proportion of the 500-odd paintings which he produced over the course of some 48 years. It is not easy to see all of them for they cover the walls up to the ceiling, some framed, most not, and lit by quite dim light. The enthusiastic volunteers (after bemoaning the fact that the rain-soaked and damp evening was to be the occasion of their annual party) gave a brief but informative talk about Churchill’s painting before we moved outside once again to view the garden. This had not only been designed by both Sir Winston and Clementine, but in his case also partly physically built by him as well. He was, it seemed, not bad with a trowel and cement and something of a dab hand at bricklaying! He even became an honorary member of the Amalgamated Union of Building Trades Workers (AUBTW), although this was not universally welcomed by the left-wing members. * Like his painting, he used bricklaying as light relief from politics and government, and as well as laying courses of bricks for the many garden walls he helped construct a one-room cottage for his daughters, which became known as the ‘Marycot’. As we looked back at the fairly unprepossessing frontage of Churchill’s former family home and down towards the lake with the descendants of the Black Swans presented by the Australian Government, and the swimming pool in which his family had guests had enjoyed themselves, it was very hard not to feel that one should make more effort to use all the hours in the day to their fullest extent. The problem is how many of us could cope with only a few hours’ sleep – or believe that if we did this would help the rest of the world in any way? A quote someone gave me the other week (which I discovered was from Florida-born celebrity painter Bob Ross (1942-1995), sprang to mind: “Talent is pursued interest. Anything that you’re willing to practice you can do”. The trouble is most of us clearly aren’t driven to put in the practice. Churchill not only did so, but proved he had more talents than most. Visit Chartwell and be impressed and inspired, but be prepared to feel totally inadequate.